New Delhi: Jazz India Circuit’s 2017-18 season culminated on Saturday, March 17th, at One Golden Mile in the National Capital, with an evening bursting with talent, intensity and the sharp flavour of freedom synonymous with jazz. Headlined by Grammy-nominated Jamison Ross, the concert also featured a mind-blowing performance by students and teachers from One World College of Music, which was followed by a collaboration between veteran Brazilian composer, pianist and singer Jim Porto and Still Waters, and left audiences clamouring for more. 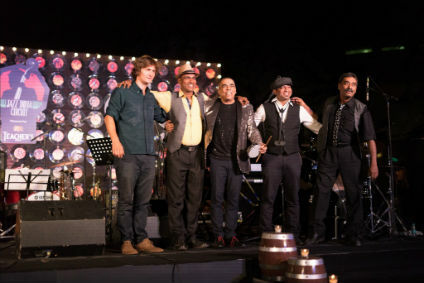 Produced and presented by pioneering entertainment company Teamwork Arts, the 2017-18 season of the Jazz India Circuit was all about getting into the groove, the subtleties of rhythm and the power of percussion with legendary jazz drummers headlining an electrifying series of concerts across the country. The JIC 2017-18 season has brought to India some of the world’s finest percussionists and drummers; the season began with Scandinavian drumming exponent Joost Lijbaart performing at the JIC Launch Concert at Gurugram, Jojo Mayer headlining the Goa International Jazz Live Festival and the first of the twin concerts in Delhi featuring Dave Weckl. The spectacular finale featured a potent and dynamic soundscape where Grammy-nominated percussionist Jamison Ross performed a combination of music from his debut album Jamison and recently released All for One. A composer, an arranger, a vocalist and drummer, Jamison took listeners on a musical journey that unified his drumming abilities and vocal assets. Commenting on what jazz means to him and this initiative by Teamwork Arts, Ross said, “Jazz is life, its freedom; jazz is the spontaneous thing that you can’t count on, the thing that you plan, the thing that you feel, it’s the essence of life that happens through music. It was inspiring for us to look at the audiences and see the smiling faces. Whenever you have a festival that brings artistes like myself, Dave Weckl, Jojo Mayer, into one city, for people to come and enjoy, what you are doing is sailing into the culture of the city.” The performance brought the audience to its feet as they clung to every beat and begged for more. Having received a standing ovation, the performance was extended on demand and ended with Jamison performing an encore of two of his most-loved songs – Call Me and Deep Down in Florida. Audiences went home sated and awestruck as curtains drew on the JIC 2017-18 season.